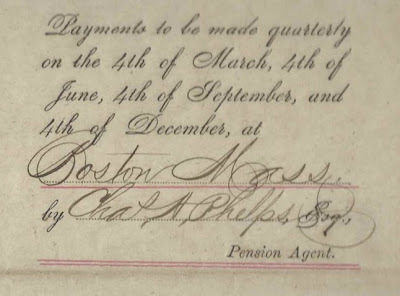 War of 1812 Widow's Pension, No. 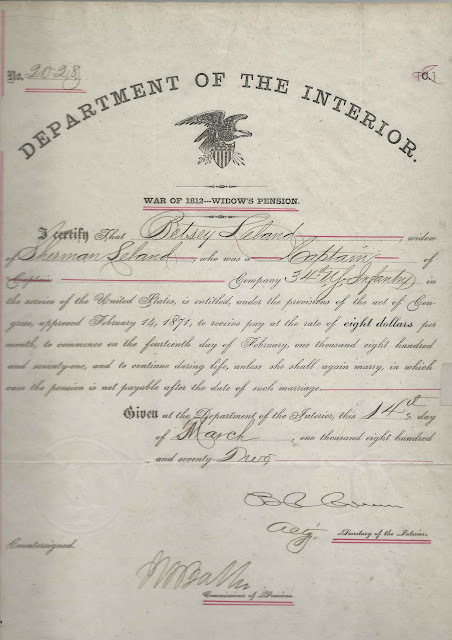 2028, for Betsey Leland, widow of Sherman Leland, a Captain with the 34th Infantry at Fort Sullivan at Eastport, Maine, on Moose Island. The pension awarded Betsey $8 a month. 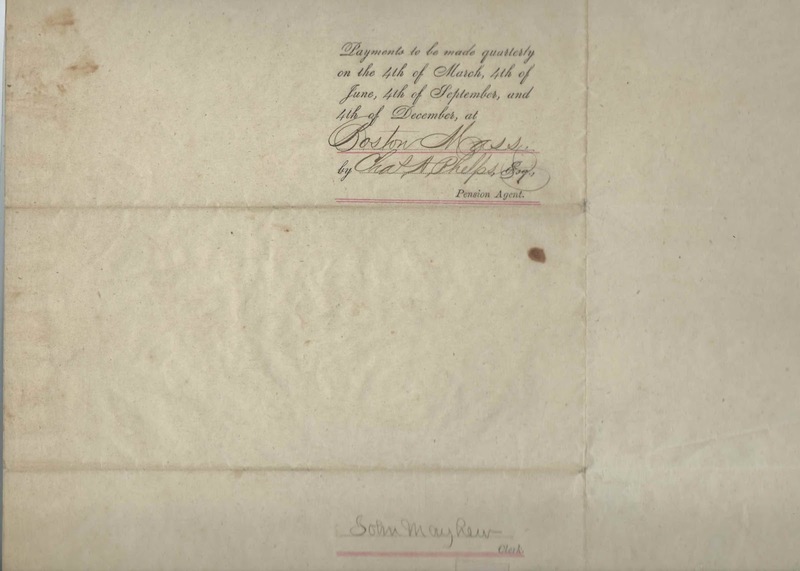 Sherman Leland was a Massachusetts native who moved to Eastport, Maine, on Moose Island in Passamaquoddy Bay, about 1810 to set up a legal practice. He joined the local militia a few months after his arrival. In 1813, he was appointed Captain in the 34th Infantry and served at Fort Sullivan, located on a promontory at Eastport, until June of 1814. A month later Fort Sullivan was captured by a British fleet, whereupon Leland left to settle at Roxbury, Massachusetts. Moose Island was held by the British until 1818, when it returned to U.S. control. At Roxbury, Massachusetts, Leland again practiced law and served in both houses of the Massachusetts Legislature; he was president of the Massachusetts Senate in 1828 and 1829. In 1830, he was appointed Judge of Probate for Norfolk County and served in this capacity until his death in 1853. More information on Sherman Leland comes from a brief biography published in a Maine State Bar Association publication in 1922. During his term at Fort Sullivan, Leland was one of a group of officers disenchanted with their commanding officer, George Ulmer. Ulmer was ultimately discharged and felt he had been unfairly maligned, especially by Leland. Eventually, Ulmer managed to have his rank restored, in name only, thanks to his acquaintance with Maine Congressman Richard Cutts. Cutts was married to Dolly Madison's younger sister Anna Payne Cutts, and arranged for Ulmer to have an audience with President Madison, who proved sympathetic to the difficulties Ulmer had faced in trying to rein in the flourishing smuggling industry in the border area of Maine and New Brunswick. Major Philip M. Ulmer: A Hero of the American Revolution, written by Patricia M. Hubert and published in 2014. The book includes much information on George Ulmer, who was Philip's brother. Sherman Leland was born at Grafton, Massachusetts [or at Cambridge, Massachusetts], on March 29, 1783, the son of Eleazer and Elizabeth (Sherman) Leland. On October 13, 1811 at Roxbury, Massachusetts, Sherman Leland married Elizabeth Adams, "Betsey", daughter of Andrew Adams, Jr., and Lucy (Merriam) Adams. Sherman and Betsey (Adams) Leland had, I believe, three sons: Edwin Leland; Henry Leland; and William Sherman Leland. Sherman Leland died November 19, 1853 at Roxbury, Massachusetts; Betsey died November 28, 1878 at Somerville, Massachusetts. They're buried at Mount Auburn Cemetery at Cambridge, Massachusetts. No prizes for guessing why this one caught my eye especially Pam - thanks for sharing!